[134 Pages Report] The automotive battery sensor market is estimated to be USD 2.18 billion in 2017 and is projected to reach USD 4.92 billion by 2025, at a CAGR of 11.09% during the forecast period. The base year for the study is 2017 and the forecast period is 2018–2025. 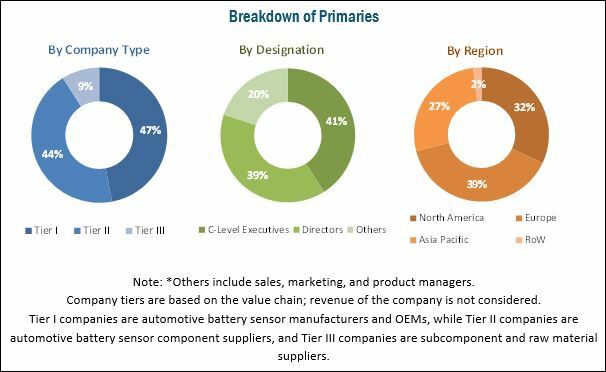 The automotive battery sensor market is primarily driven by the rising demand for fuel-efficient vehicles, increased vehicle production, and the rising emission concerns. Rising emission concerns and growing demand for fuel-efficient vehicles are expected to drive the automotive battery sensor market. Intelligent battery sensor (IBS) is a shunt-type sensor that analyzes the battery pack and provides information about voltage, current, and temperature. It is directly mounted on the negative terminal of the battery in a vehicle. IBS monitors the battery continuously and provides information about 3 main parameters. These 3 parameters are state-of-charge, state-of-function (power ability), and state-of-health (aging) of the battery. The monitoring of the battery helps to identify defects and provides this information to the driver. Hence, vehicle breakdowns due to battery issues can be minimized with the help of IBS. 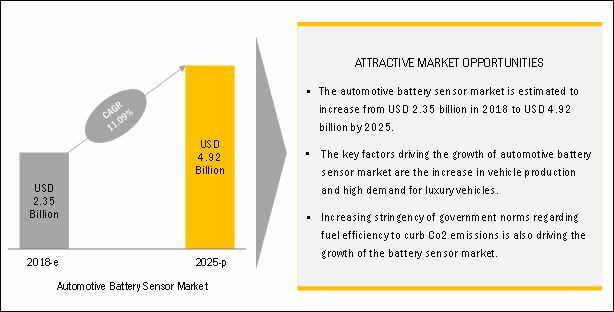 The growth of the automotive battery sensor market can be attributed to the increasing stringency of emission norms worldwide, rising adoption of electrical & electronic components, increasing vehicle production, and rising demand for luxury vehicles. The automotive battery sensor market comprises several global market leaders, which makes it highly competitive. Bosch, Continental, HELLA, and NXP are some of the leading market players that are continuously developing new products to expand their automotive battery sensor business at the global level. The rising adoption of advanced technologies in modern vehicles is expected to create growth opportunities for the automotive battery sensor market. These technologies directly impact the number of vehicle batteries and the sensors present in the batteries. Battery sensors provide the battery’s information such as the temperature, voltage, and current. The number of sensors used in a vehicle depends on advanced technologies installed in the vehicle such as start-stop system. Moreover, sensor manufacturers such as Bosch, Continental, NXP, and others are focusing on advanced sensor technologies to improve the battery experience. The growth of the market can be attributed to the rising demand for IBS in developing countries such as Mexico, India, China, and others. Also, increasing vehicle production worldwide, government regulations, and the rising demand for fuel-efficient vehicles are fueling the overall growth of the market. This research study involves the use of secondary sources such as company annual reports/presentations, industry association publications, automotive magazine articles, directories, technical handbooks, World Economic Outlook, trade websites, technical articles, and databases such as Hoover’s, Bloomberg Businessweek, and Factiva to identify and collect information for an extensive commercial study of the automotive battery sensor market. The primary sources comprise industry experts, engineers, product managers, R&D managers, automobile OEMs, battery sensor manufacturers, battery manufacturers, and sales managers. In-depth interviews have been conducted with various primary respondents, including key industry participants, subject-matter experts, technical experts, battery sensor experts of major market players, and industry consultants to obtain and verify critical qualitative and quantitative information as well as to assess prospects. The following figure illustrates the market research methodology applied to make this report on the automotive battery sensor market. The ecosystem of the automotive battery sensor market consists of automotive battery sensor technology manufacturers such as HELLA (Germany), Continental (Germany), Bosch (Germany), Furukawa Electric (Japan), NXP (Netherlands), Vishay (US), Texas Instrument (US), Denso (Japan), ams AG (Austria), Inomatic (Germany), and TE Connectivity (Switzerland). Which communication technology type will lead the automotive battery sensor market (LIN and CAN)? What are the industry trends of the automotive battery sensor market? What would be the impact of government mandates to regularize emission norms? What are the technological developments in the automotive battery sensor market? 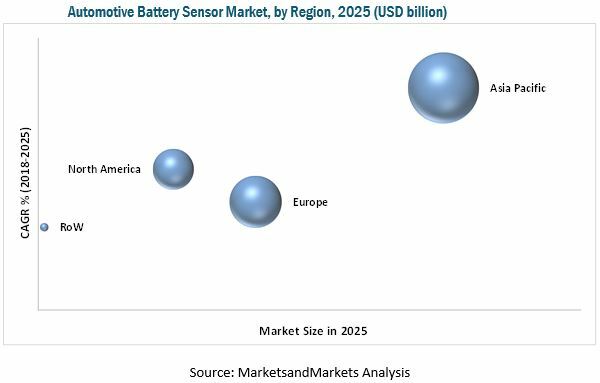 The value of the automotive battery sensor market is estimated to be USD 2.35 billion in 2018 and is projected to reach USD 4.92 billion by 2025, at a CAGR of 11.09% from 2018 to 2025. The key growth drivers of the market are increasing vehicle production, high demand for fuel-efficient vehicles, stringent emission regulations, and increasing demand for luxury and commercial vehicles. The growing sales of hybrid vehicles in Japan, China, India, and others are driving the market for automotive battery sensors. Automotive manufacturers are focusing on the production of hybrid vehicles to meet the stringent emission norms. Moreover, policies such as exemption from road tax, crowding charge waiver, and free car parks at various places have encouraged consumers to buy hybrid vehicles. In Asia Pacific, the adoption of HEVs is increasing. China, India, and Japan have made significant investments to encourage the adoption of HEVs. The growth of the automotive battery sensor market in the passenger car segment is attributed to the increased passenger production in several regions. Passenger car production has increased across the globe owing to several factors such as the growing demand for passenger cars, increase in purchasing power, and capacity expansion by OEMs, particularly in emerging economies. Also, the rising demand for luxury vehicles, fuel-efficient passenger cars, stringent CO2 emissions, and improved battery life have fueled the overall growth of the passenger car segment. The automotive battery sensor market for the 12V battery segment is also expected to grow due to its low-cost benefit. Also, 12V batteries are used in regenerative brake technology, start/stop system, and others. Moreover, the continuous rise in the production of vehicles and stringent emission norms to curb CO2 would prosper the overall growth. Also, 12V automotive batteries are preferred due to the ease of recycling. As per the United States Environmental Protection Agency, 100 million auto batteries are replaced per year, and 99% of them are turned in for recycling. As the 12V batteries are mostly recycled, the cost of a 12V battery is low. The market for LIN is the largest due to its low-cost benefit. In general, inexpensive silicon is used in this system during manufacturing, which results in the low cost of the system. Battery management system installed with LIN offers various features such as fast data transmitting, data checksum & error detection, configuration flexibility, no arbitration required for optimum operation, temperature situation control, self-synchronization, and others, which is another major factor for the rapid growth of this segment. The Asia Pacific market is dominated by China and Japan where the automotive industry, with government support, is growing at a faster pace than other countries in the region. Also, the growth of the Asia Pacific market can be attributed to the increasing vehicle production and rising demand for fuel-efficient vehicles in Japan, South Korea, India, and China. Moreover, increasing passenger car production in China and India is the key factor in fostering the growth of 12V batteries in the Asia Pacific region. The growing adoption of IBS in automobiles due to China VI & India VI regulations and the increasing demand for luxury vehicles are also expected to drive the automotive battery sensor market in the region. OEMs used 12V batteries in vehicles because of the low adoption of electronic components. Hence, vehicles required low voltage for the operation of electronic components. Today, with the advancements in technology, a 12V intelligent battery sensor is used to monitor the battery status. A 24-volt battery is installed in vehicles that require more power for the proper functioning of electrical components. It is mostly installed in commercial vehicles, which need more power for the operation of electronic systems. A Passenger Car (PC), as defined by the OICA, is a motor vehicle equipped with at least 4 wheels, comprising not more than 8 seats. The PC segment is the largest, by vehicle type, and includes sedans, hatchbacks, station wagons, Sports Utility Vehicles (SUVs), and Multi-Utility Vehicles (MUVs). This vehicle segment is the most promising market for electric vehicles as it is the largest segment in the automotive industry. The PC segment of the electric vehicle market is growing at a significant rate in emerging economies in the Asia Pacific region. The market growth in the region can be attributed to a rise in the GDP and population, improvement in lifestyle, increased purchasing power of consumers, and development of infrastructure. Vehicles that have authorized mass between 3.5 tons and 7 tons are called light commercial vehicles. LCVs have come a long way from having bare essential features to full-blown utility vehicles that can be used for passengers as well as commercial purposes. A Controller Area Network (CAN) bus is used to maintain communication between various components of a vehicle in short radius region. It is designed to fix the problem of the bulky wiring harness. CAN uses simple wiring harness in-vehicle networks, decreases wiring cost, complexity, and weight. CAN is a peer-to-peer network, i.e., every individual node has permission to read and write data on the CAN bus. The key factor restraining the growth of the automotive battery sensor market is the system malfunctioning. Also, the IBS technology is relatively new and is developed by a limited number of players. The key challenge associated with IBS is the high cost. The high cost of IBS vis-a-vis other battery sensors restricts its adoption. Moreover, the cost of the IBS varies with the voltage of the battery. The automotive battery sensor market is dominated by a few global players and several regional players. Some of the key manufacturers operating in the market are HELLA (Germany), Continental (Germany), Bosch (Germany), Furukawa Electric (Japan), NXP (Netherlands), Vishay (US), Texas Instrument (US), Denso (Japan), ams AG (Austria), Inomatic (Germany), and TE Connectivity (Switzerland).